As a big storm approaches, two strangers arrive in the forest. All the animal families, safe in their homes, are worried. They wonder, What are they doing there? What do they want?? So, as the pair knocks at the door of one home after another asking for shelter, all the animals turn them away, leaving them to fend for themselves. But then an accident suddenly forces the fox family out into the snow and the wind, and the foxes find they must ask these outsiders for help. Will they find it in their hearts to give it? This couldn’t have been more perfect. It’s such a heart-warming story that even if it’s minus twenty Celsius degrees outside, this story made me feel all warm inside. I have a really soft spot for animal stories and themes of kindness, acceptance and generosity. You see, in this book, the animals are not so welcoming when a storm strikes. Two bears need help, but no one is willing to provide them with some food, warmth or a place to stay. Until some animals find themselves in the bears’ shoes and realize what it means to have nothing and be denied help. My favourite picture books are the ones that I can link to real life events or situations. In real life too you are given a choice—whether to help those in need or not. The watercolour illustrations are very atmospheric and detailed. The story doesn’t even need rhymes to be poetic—it manages that on its own. 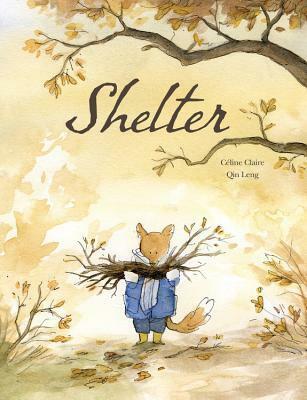 SHELTER is an important picture book to share with children.